This katydid is perched on Yerba Santa (Eriodictyon angustifolium) from which it can probably feed only a little before moving to some other shrub. It was observed along the Ballantine Trail, Four Peaks, Maricopa Co., Arizona in Oct. 2008. Katydids are sometimes known as long-horned grasshoppers in reference to the very long antennae - notice that the ends of the long reddish antennae are cropped in the image at left. The tegmina are translucent greenish brown. 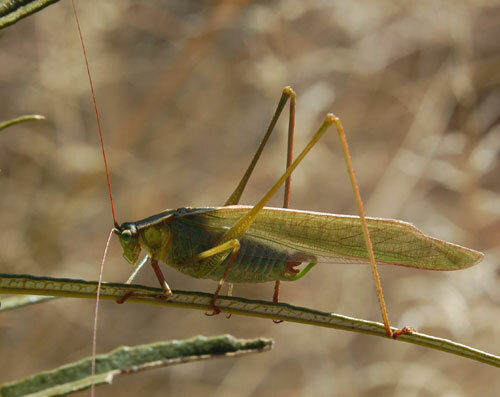 Mexican Bush Katydids feed on tender shoots and leaves of various shrubs and are typically found in Upper Sonoran Desert or Chaparral vegetation types. They are found also in southern California and northwest Mexico. At night they will occasionally be attracted to electric lights. Length ranges from 5 cm. There are several similar species and specific id may require careful examination under magnification.